Stapleford Park is a magnificent 17th century stately home set in 500 acres of parkland, lake and woods originally created by the legendary Capability Brown. 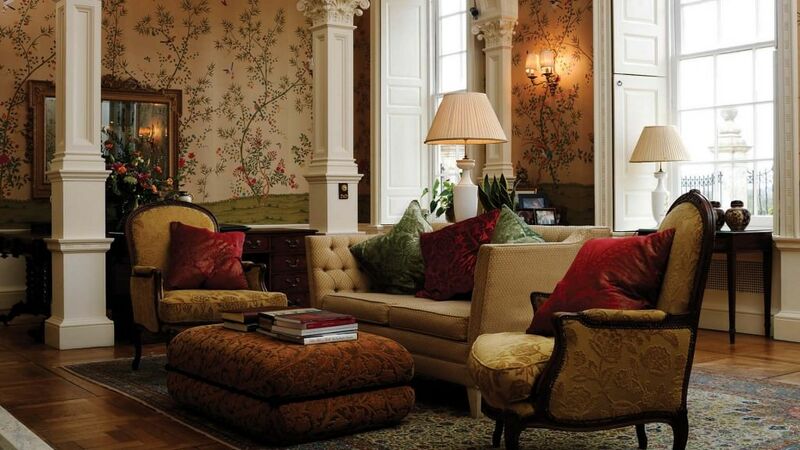 With 55 individually designed rooms that reflect the style of their creators: famous names such as Mulberry, David Hicks and Crabtree and Evelyn have all contributed to the hotel’s distinctive style. Enjoy beautiful gardens and an array of country pursuits – try clay pigeon shooting or falconry or tee off on the Donald Steel designed ,18 hole championship golf course. On a less energetic note, one of the jewels of Stapleford Park is the stunning 22 metre mosaic Pool, complete with sauna, steam room and Jacuzzi or unwind in one of seven unique treatment rooms offering an extensive range of therapies. The Victorian stable block is home to a gymnasium and fitness studio with personal trainers on hand. 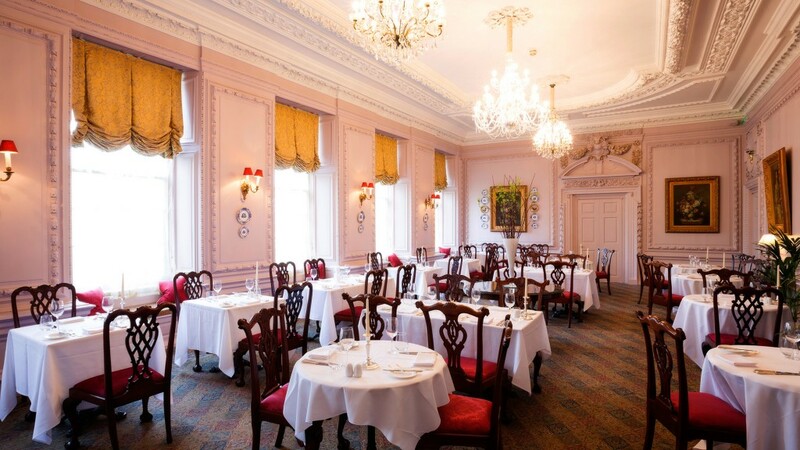 Dining at Stapleford Park means amazing food and unobtrusive service complemented by the uniquely elegant surroundings of the award winning Grinling Gibbons dining room. Stapleford Park’s elegant function rooms include The Grand Hall, one of England’s finest rooms for weddings and corporate hospitality, the rich and magnificent Harborough Room perfect for a private dinner party or most elegant board meeting whilst private dining or cocktails can be taken in The Billiard Room, overlooking the terrace and gardens. 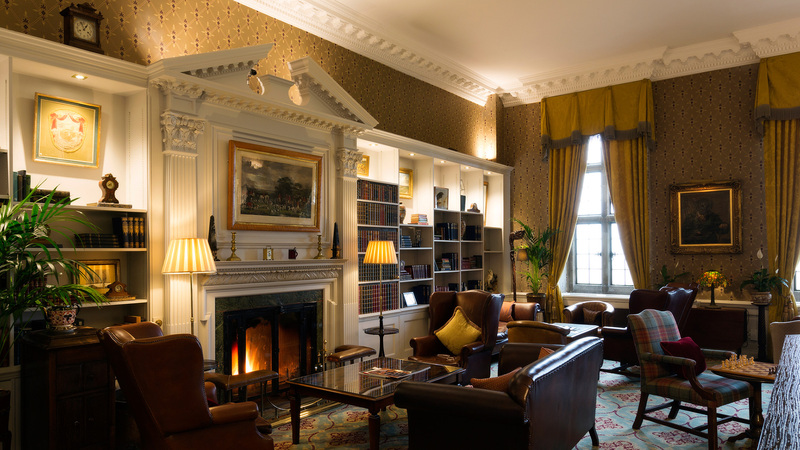 Stapleford Park is the ultimate retreat to work and play. Activities: 18 hole Donald Steel Designed Golf Course on site. Golf lesson available. Archery arranged (on-site). Falconry school (on-site). Only dogs allowed, maximum number per room. Baby-sitting (charge). Brasserie restaurant. Butler service. DVD rental. Family rooms. Fine dining restaurant. Golf course. Gymnasium. Indoor pool. Interconnecting rooms. Meeting rooms (charge). Pets allowed (charge). Safe deposit box (all rooms). Spa. Sports trainer. Tennis courts. TV (all rooms). VCR on request. Wifi. Gourmet food is served in the elegant 2 AA Rosette Grinling Gibbons Restaurant, while our private dining rooms in the Harborough Room and the Billiard Room are used to host intimate dinner parties in an elegant country house setting. The cuisine under Executive Chef, Luke Holland, is modern classic with worldwide influences as well as classic British dishes. 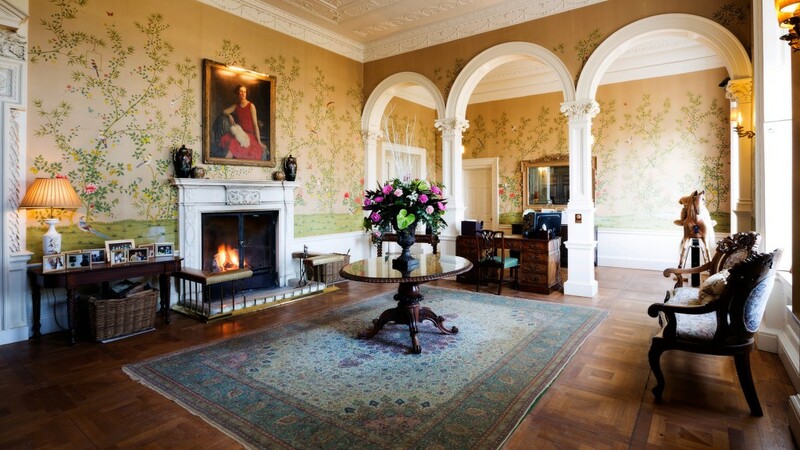 Situated in the converted Victorian stable block is the Stapleford Park. Just a five minute stroll through the picturesque gardens is the House where the pool complex, with a heated 22m pool, steam room, sauna and Jacuzzi can be found. Seven treatment rooms, a relaxing lounge area, fitness studio and fully equipped gym, pool, steam room, sauna and Jacuzzi. Experience Stapleford Park as the Edwardians did, inviting your friends and family to our country house for a wonderful, private party. All of the public areas of the main house, and the 48 personality imbued bedrooms, would be yours exclusively for your event from 3pm on the day of the event to 11am the following day. Please note that exclusive use does not include the golf club and spa, hotel grounds or the swimming pool. Sunday or Monday – From £10,500 plus a minimum food and beverage spend of £6,000 single occupancy or £8,000 double occupancy. Tuesday, Wednesday & Thursday – From £12,000 plus a minimum food and beverage spend of £6,000 single occupancy or £8,000 double occupancy. Friday or Saturday – £19,500 plus a minimum food and beverage spend of £8,000 single occupancy or £10,000 double occupancy. This will include complimentary Wi-Fi, complimentary Newspaper and Full English Stapleford Breakfast the next morning. All prices are excluding VAT including food and beverage minimum spends. 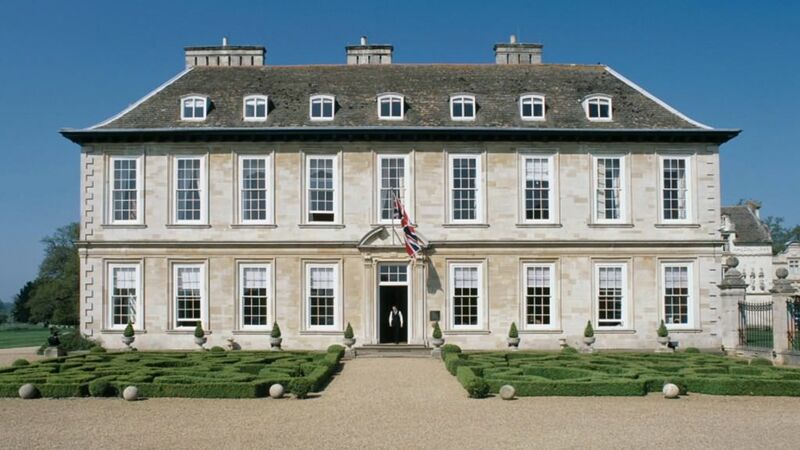 Imagine, the house at Stapleford Park exclusively yours, for your dream wedding. Evoke the style and grandeur of weddings from a bygone age when you invite your guests to privately celebrate your nuptials in our country house. 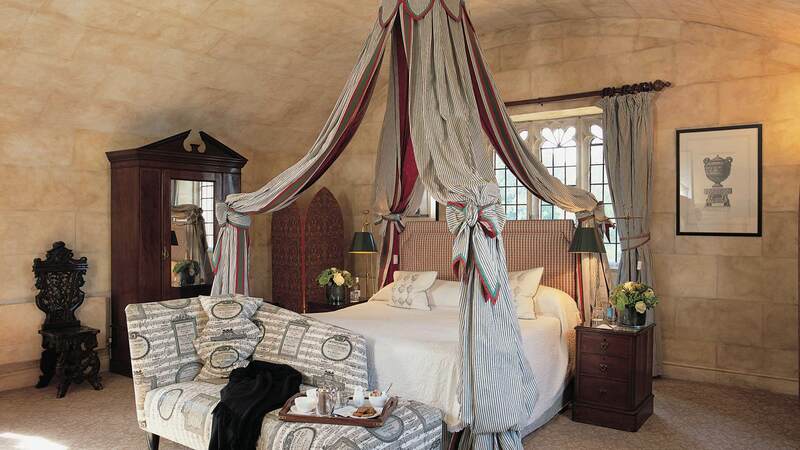 Match your guests to the individually designed bedroom that will suit them best; the Lady Gretton room for the mother of the bride perhaps, almost certainly the romantic Baker suite for the bridal party. Each of the 48 bedrooms will be yours, from 3pm on your arrival day, until 11am on your departure day, with breakfast provided for guests in the Grinling Gibbons dining room. In addition to the above, a wedding package must be selected. 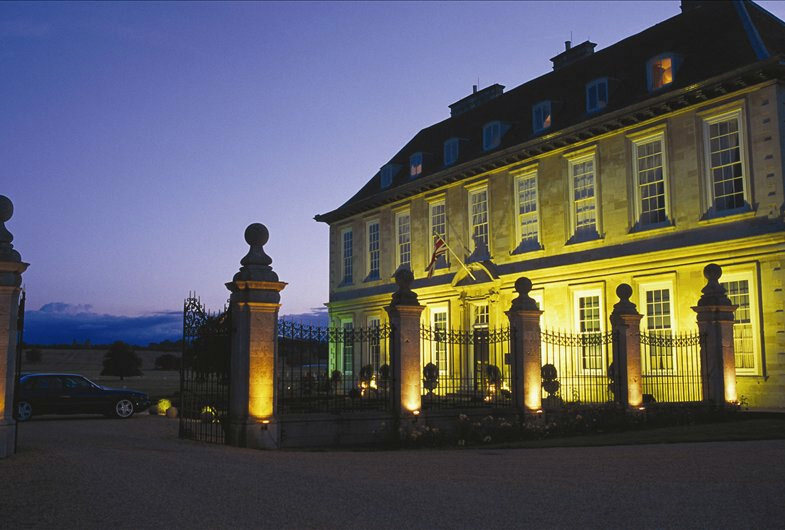 The unique atmosphere of Stapleford Park allows you to comfortably mix business with pleasure. Whether your function is a high-powered business meeting, motivational conference or simply a private dining celebration our friendly and attentive staff will ensure everything runs smoothly. 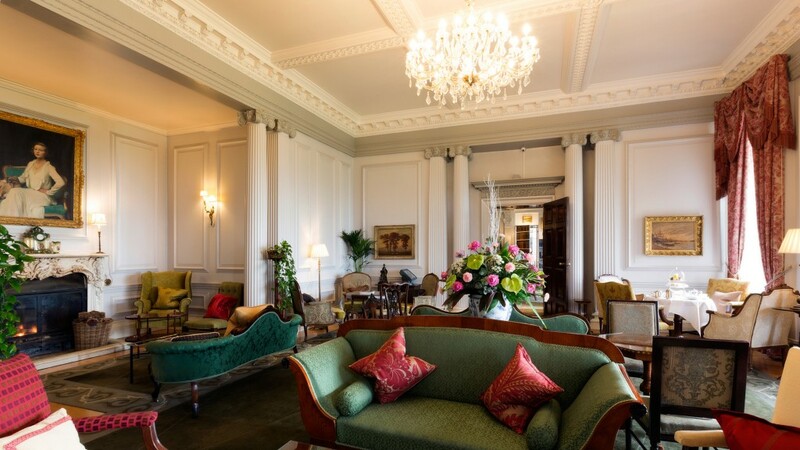 Stapleford Park is much more than a stately home, to our delegates and business travellers alike it’s a fantastic meeting venue with all the comforts of home. Guide price: Double room for two people per night including breakfast, Wi-Fi and choice of newspaper from £180. 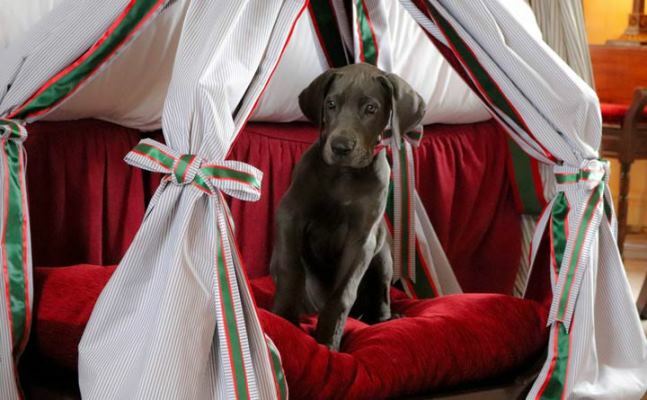 Indulge your four-legged friend at Stapleford Park, with our luxury canine package, which includes doggy-afternoon tea and a bespoke dog bed. Prices based on two people sharing and one dog inclusive of VAT. Additional dogs charged at £45. Single occupancy supplements will apply. Bookings need to be made at least 7 days in advance of your stay. Check in to an exquisite three-course dinner in our 2 AA Rosette Restaurant Grinling Gibbons, followed by an overnight stay in our country house and full English breakfast in the morning. Overnight stay with three-course dinner from £129 per person. Prices based on double occupancy and inclusive of VAT. Based on 2 people sharing a House double room and dining from our à la carte menu in the Grinling Gibbons Restaurant (supplement on some dishes may apply). Single occupancy supplements will apply. Upgraded bedrooms are available at an additional charge. Promotion is non-refundable and non-transferable. Available Sunday to Thursday subject to availability. Prices starting from £136 per room per night bed and breakfast – applicable when booking at least 20 days in advance, full pre-payment required, non-refundable, non-transferable. From the South: Take A1 north from London towards Grantham. Leave onto B676 sign posted Colsterworth and Melton Mowbray. Drive 9 miles through Saxby, then turn left at the signpost to Stapleford. Alternatively travel via M1 and leave at J21A, sign posted A46 Leicester and Newark, and follow A607 Melton Mowbray. Follow ring road A607 and signs for Grantham, stay in the right hand lane until the Grantham road turns left. Drive straight across the traffic lights, following signs for B676 to Colsterworth and Stapleford. After 4 miles turn right to Stapleford. We are approx. 200 yards on the left. From the North: Leave M1 at J24, through Kegworth on the A6 then follow A6006 to Melton Mowbray. From here follow as above. Overlooking 1600 acres of woodland and at the centre of its vibrant community is Belvoir Castle where you can experience an array of events and activities in and around the estate. Similarly Rockingham Castle offers tours, plentiful history and gardens to explore. Admission charges will apply so please visit their individual websites for more information. Just 45 minutes’ drive from the hotel, Donington Park is host to over 10 decades of motorsport and was the first permanent park circuit in England. After years of uncertainty the park’s future is now assured and provides a great day out for those who love motor racing. Aside from the racing, visitors can also enjoy festivals through the year as well as to visit the nearby Donington Markets. Rutland Water is less than an hour away from the hotel and hosts a number of outdoor activities for the whole family to enjoy. Activities include water sports, cycling, zorbing, walking trails, wildlife workshops and many more, Rutland Water is a great destination for a day of activities for the whole family. It is free to visit, with hiring of equipment and activities priced – for more information visit their website. Now owned by the National Trust, Belton House, near Grantham, is a beautifully symmetrical Restoration-period house. The formal Dutch and Italian sunken gardens, together with the elegant Orangery, complement the house and there is a lakeside walk in the surrounding parkland. This house was featured as the home of Lady Catherine de Bourgh in the BBC production of ‘Pride and Prejudice’. Belvoir Castle stands high above the Vale of Belvoir, near Grantham, and is home to the Duke and Duchess of Rutland. The original castle was built on this site in the 11th century and the existing 19th century castle contains collections of paintings, sculptures, porcelain and furniture. Burghley House is the largest and grandest house of the Elizabethan age which is still privately owned but also open to the public. Capability Brown landscaped the magnificent grounds, including the deer park, and the house contains one of the finest private collections of seventeenth century Italian paintings. Between 1924 and 1933 Lord Burghley earned an international reputation as a hurdler, his achievements were featured in the film ‘Chariots of Fire’ and the Olympic medals and countless other trophies are on display in the house. Rockingham Castle is situated near Corby and is steeped in over 900 years of history. It houses an educational and enlightening exhibition on the Normans, the Tudors, the Civil War and the Victorian era. Special events at Rockingham include open-air performances and re-enactments of the Siege of Rockingham between the Cavaliers and the Roundheads. The castle’s remarkable hill top location provides fine views over five counties. Set in 3,100 acres of beautiful countryside, Rutland Water is Europe’s largest man-made lake. Water sports such as wind surfing, sailing, canoeing and fly-fishing are available and cycling/walking are also popular. The circuit around the reservoir is 25 miles and there are a number of good pubs en route where you can relax. It is also possible to take a cruise on a paddle steamer called the Rutland Belle and enjoy the scenery. Since the creation of the reservoir twenty years ago the nature reserve has become an important wildlife sanctuary. Over 250 species of birds have been counted here and wildfowl numbers can exceed 20,000 in the winter – you may even be lucky enough to catch sight of an osprey. Oakham has managed to retain much of its original charm and the Market Square fills with little stalls every Wednesday and Saturday. There are a number of antique shops as well as a magnificent fine art shop selling highly collectable works of art. Oakham’s most famous character was Jeffrey Hudson, a tiny dwarf measuring only 18″ high, who was put in a pie which was presented to King Charles I in 1628. Oakham Castle, famous for its collection of horse shoes gathered from visiting nobility including members of the Royal family, and also for the court which has been held, since medieval times, every Monday. Stamford, with its splendid Georgian architecture, was relatively undiscovered until it became famous as the location for the BBC’s period drama ‘Middlemarch’. It is best explored on foot and it is fascinating to visit the 16th and 17th century coaching inns and medieval churches. There are a number of fine antique shops in the town including silver and furniture specialists. A street market is held on Fridays and it is well worth trying some local gastronomic delights such as haslet – a delicious cold meat made of pork, rusk, sage and pepper – and Lincolnshire plum loaf. What does your dream wedding look like? The couples that gravitate towards Stapleford Park are captivated by the beauty of the house and surrounds, its rich history, its many listed buildings, and its spectrum of outdoor spaces, from the formal to the natural. Yet they also feel the warmth that is interwoven into the house itself, the perfect setting for great festivities, they see their dream wedding orchestrated in the delightful rooms of the main house and spilling out into the verdant greenery of outside, and are beguiled by the charming blend of timeless luxury partnered with every modern wedding desire. Visit us at Stapleford Park and see which of our many rooms licensed for civil ceremonies can realise your wedding vision. Arrangements can be make for external caterers. Radiantly airy, for weddings with the perfect unification of indoors and outdoors. The Orangery with its glass dome, and doors opening up to the gardens with stunning house views, is your own little world for the day, for up to 150 people. Family and friends seated in the oak pews either side of the nave, a photographer up high in the oak gallery poised for the perfect shot, all eagerly anticipating the arrival of the newly married bride and groom, to witness a spiritual Blessing of their marriage. The 18th century Church of St Mary Magdalene is a wondrous place for a blessing; at once striking and beautiful with its enchanting setting on the estate, imposing tower and historical monuments. The church now belongs to the Churches Conservation Trust. For an intimate wedding, bathed in sunlight, The Morning and Gilt rooms are adjacent to the reception at the front of the house, overlooking the parkland. Richly decadent, for weddings with an opulent feel. The Harborough Room, with its scarlet Gainsborough silk wallpaper and glittering chandeliers is a beautiful setting for up to 24. For a wonderful blend of splendid country estate and relaxed Grade I listed family home, choose Stapleford Park for your wedding reception. Let the varied settings at Stapleford Park be your wedding inspiration. We will work alongside you to bring your unique wedding dreams to fruition, set in the heart of some of England’s most picturesque countryside. 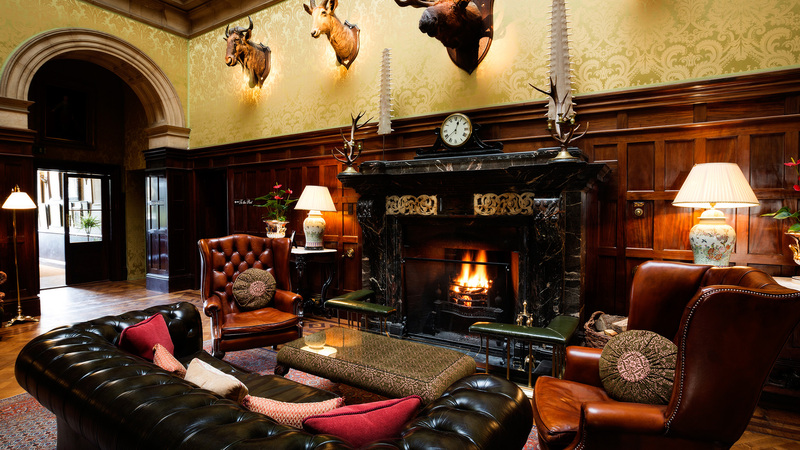 An intimate gathering in your favourite of our private rooms; the ornate Billiard Room, the candlelit opulence of the Harborough Room or the rustic minimalism of the Old Kitchen. Visit us to find your perfect wedding reception space. If you envisage looking out from your top table to family and friends enjoying the perfect moment, seated on immaculately presented tables, configured to your desire, then our Grand Hall is perfect. The Grand Hall adjoins our Orangery, and thus the gardens and parkland. The Grand Hall and Orangery in tandem provides you and your guests with a private, self-contained space for your wedding day. Choose one of our three wedding packages for all seasons or perhaps experience Stapleford as a winter wonderland, when log fires burn bright and a pretty frost blankets the lawn, with our winter wedding packages. For further information call us on 01572 787016 or email [email protected]. Group room rates are available. A minimum number of 80 guests required for use of the Grand Hall. Prices are inclusive of VAT. Additional room hire fee applies for civil ceremony. For winter wedding packages, additional guests are charged at £115.00 per person. Our Ruby package includes drinks reception with two glasses of sparkling wine or orange juice per person and cocktail nibbles. The drinks reception is followed by a three course wedding breakfast with coffee, tea and petit fours, half a bottle of our selected wine per person, still and sparing mineral water accompanied by a sparkling wine toast. Chair covers and sashes are included. The Ruby Package also includes a complimentary bridal room for the bridal couple and menu tasting for two persons. Select our Sapphire wedding package for a drinks reception with two glasses of champagne, Pimm’s or orange juice per person and cocktail nibbles, followed by a three course wedding breakfast with coffee, tea and petit fours, half a bottle of our selected wine per person, still and sparkling mineral water accompanied by a champagne toast, plus an evening finger buffet. Chair covers with sashes are included. The Sapphire Package also includes a complimentary bridal room for the bridal couple and menu tasting for two persons. The Diamond wedding package includes a drinks reception with two glasses of champagne, Pimm’s or orange juice per person and canapés. This is followed by a four course wedding breakfast with coffee, tea and petit fours, half a bottle of our selected wine per person, still and sparkling mineral water accompanied by a champagne toast. An evening finger buffet, and chair covers with sashes are also part of the Diamond package. The Diamond Package also includes a complimentary bridal room for the bridal couple and menu tasting for two persons. The winter wedding package includes drinks reception with two glasses of sparkling wine and cocktail nibbles, followed by a three course wedding breakfast with coffee, tea and petit fours, half a bottle of our selected table wine per person, still and sparkling mineral water accompanied by a sparkling wine toast. For the bridal couple this package also includes complimentary menu tasting and a bridal room for the wedding night. *Excluding bank holidays, Christmas Eve and New Year’s Eve. This package includes drinks reception with two glasses of sparkling wine and cocktail nibbles, followed by a three course wedding breakfast with coffee, tea and petit fours, half bottle of our selected table wine per person, still/sparkling mineral water accompanied by a sparkling wine toast. From £175 per person | Minimum 8 delegates | Up to 180 delegates. From £65 per person | Minimum 8 delegates | Up to 180 delegates. Stapleford Park is a perfect place for corporate golf days this season with no temporary greens or winter tees. The course maintains its great conditions year round for a great golf experience. Preferential accommodation rates available.